Citing rapid melting at the poles, NOAA says global sea levels will rise faster than previously projected. This increases the flood risk for many coastal communities in the United States. 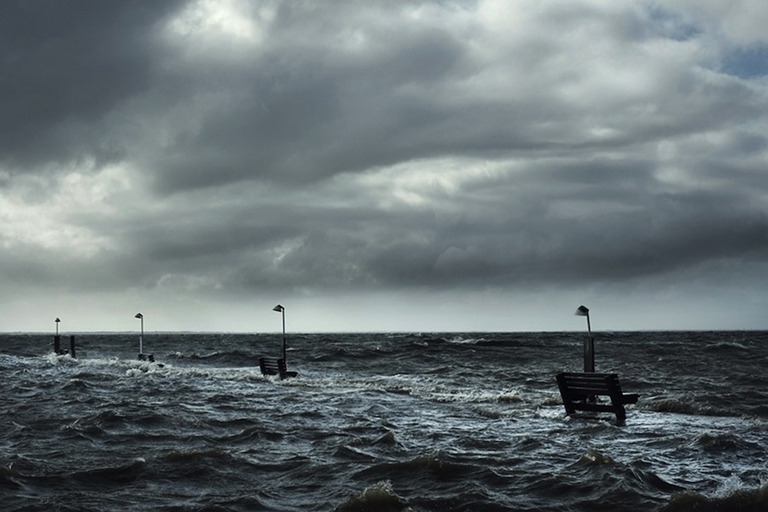 The agency’s new report, “Global and Regional Sea Level Rise Scenarios for the US”, updates a 2012 study and outlines a range of possible situations. Through 2100, it projects a global sea level rise of at least 1 foot on the low end to as high as 8 feet under a worst case scenario. The previous projections were estimated to be 4 inches and 6.6 feet, respectively. On a regional level, from Virginia to Maine, sea-level rise is expected to be 1 to 1.6 feet greater than the global average. This is because the land is slowly sinking at the same time the water is rising. This precarious combination will intensify both high tide flooding and any storm surge events in the region. The two main drivers of sea level rise are thermal expansion – a process in which water expands as it warms – and the melting of land-based ice. Both are the result of rising global temperatures. The exact amount of sea level rise will depend on how much greenhouse gases are added to the atmosphere in the near future and the rate at which the massive ice sheets in Greenland and Antarctica melt. Three years ago today Super-storm Sandy slammed the New York City tri-state area. Creating a record storm surge of 13.88 feet at the Battery in lower Manhattan and causing $70 Billion in property damages, it opened the region’s eyes to the dangers posed by rising sea levels. But, this issue is not limited to the northeast. It is a looming threat to all coastal communities in the US. In an effort to call attention to this critical situation, photographer John Ganis has created a series of images – and a soon to be published photo book – called “America’s Endangered Coast”. The two main drivers of sea level rise are thermal expansion – a process in which water expands as it warms – and melting glaciers. Both are the result of rising global temperatures. Since 1880, according to the IPCC, the average global sea level has risen about eight inches. Looking ahead, as sea levels continue to rise, future storm surges and tidal flooding events will have a higher starting point and will therefore be able to reach further inland. So, in comparison to the impacts of Sandy, a lesser storm could produce similar, if not worse, flooding in the future. Sea level rise is one of the most pressing aspects of climate change for coastal communities around the globe. Here in the US, South Florida is especially vulnerable. Raising awareness of this issue, a team of professors and students at Florida International University (FIU) have created a web app called the Sea Level Rise Toolbox. Sea Level Rise Toolbox. Credit: FIU. Climate Change is a global problem with impacts that vary from place to place. In New York City, they include hotter temperatures, heavier precipitation events, rising sea levels, and increased flooding. Each one of these local challenges was spelled out in detail by the latest report from the New York City Panel on Climate Change (NPCC). According to the report, temperatures are expected to increase between 4.1°F and 5.7°F by the 2050s and between 5.3°F and 8.8°F by the 2080s. The frequency of heat waves is forecast to jump from the current average of 2 per year to 6 by the end of century. Annual precipitation is projected to increase 4% to 11% by the 2050s and 5% to 13% by the 2080s. The report also calls for the number of days with extreme precipitation – heavy rain and snow – to increase 1.5 times by the 2080s. Local sea levels are expected to rise between 11 inches and 21 inches by the 2050s, 18 inches to 39 inches by the 2080s, and up to six feet by 2100. 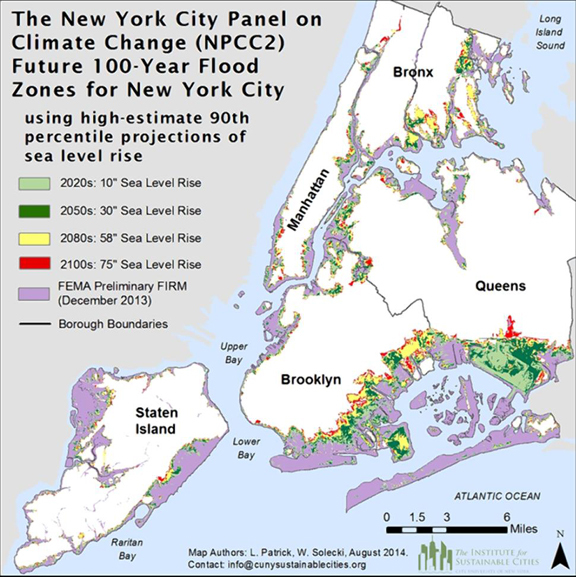 As an archipelago, NYC is especially vulnerable to sea level rise. Higher sea levels give storm surges a higher starting point, allowing floodwaters to reach further inland. That means Sandy-like flooding will become more probable in the future even with a less powerful storm. In fact, if the high end projections of sea level rise come to fruition, the current 1-in-100 year flood event could happen roughly every 8 years. The city’s flood zone is expected to double in size by 2100. These changes are not only significant for their quantities, but also for the rate at which they are forecast to occur. To put them into perspective, compare them to the recent past. Between 1900 and 2013, the city’s annual temperature increased 3.4°F, mean annual precipitation increased 8 inches, and local sea levels rose by 1.1 feet. Taking steps to both adapt to and mitigate climate change, NYC has started building flood protection systems and has pledged to reduce its greenhouse gas emissions 80% from 2005 levels by 2050. Formed in 2008, the NPCC assesses the latest climate science and analyzes the specific impacts facing NYC. It issues a report every 3 years. Two years ago today, Super-storm Sandy slammed the New York City tri-state area. Despite being downgraded from hurricane to post-tropical status just prior to landfall, Sandy was the second costliest natural disaster in U.S. history, following Hurricane Katrina in 2005. The question is, can it happen again? Coming ashore with tropical storm-force winds at high tide during a full moon, Sandy was an unprecedented storm. It formed late in the season, grew as it moved north, and instead of turning out to sea like most tropical systems, it made that now famous left hook toward the coast. Statistically, Sandy’s unusual trajectory was a 1-in-700-year event, according to a recent study by researchers at NASA and Columbia University. That said, as sea levels continue to rise, future storm surges will have a higher starting point and be able to reach further inland. So, a lesser storm could produce similar, if not worse, flooding in the future. A different study in the journal, Nature Climate Change, predicts that a current “500 year” storm surge event in NYC could happen every 50 to 240 years by the end of the century. Sandy caused a record 13.88-foot storm surge at the Battery in lower Manhattan. It flooded many low-lying areas, including parts of the NYC subway system. The massive storm, according to the CDC, directly claimed the lives of 117 people in the U.S – mostly by drowning. 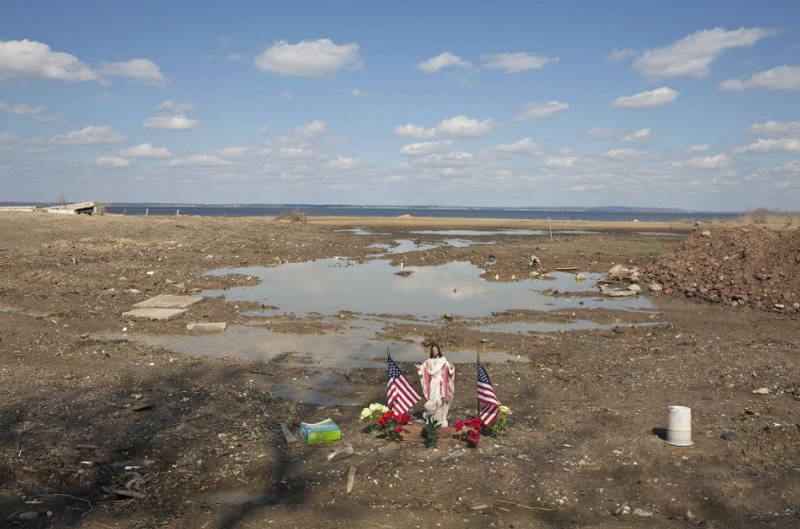 Damaging or destroying more than 650,000 homes, Sandy displaced thousands of people and caused approximately $70 billion in property damage in addition to knocking out power to 8.5 million people for multiple days. In reaction, many government agencies – at all levels – have been re-evaluating their strategies for dealing with future storm surge flood disasters. The National Hurricane Center changed its policy for issuing warnings on post-tropical storms and has developed an experimental Potential Storm Surge Flooding Map that depicts the risk associated with a storm surge during a tropical cyclone. In NYC, the Office of Emergency Management re-drew its hurricane evacuation zones to reflect the threat of higher sea levels. As these types of important improvements are being made, the arduous process of rebuilding homes and installing physical defenses against future storms is still ongoing, especially in the region’s hardest hit areas. Sea level is on the rise around the globe. Some areas, such as New York City, however, are seeing the water rise faster than others. According to the latest IPCC report, the average global sea level has risen about eight inches since 1880. Locally, in New York Harbor, the water has risen by more than a foot in the past century. The graph below shows the upward sea level trend at the Battery, Manhattan’s southern tip. In general, sea level rise has two main drivers. They are thermal expansion – a process in which water expands as it warms – and the melting of land based ice, such as glaciers and ice sheets. Both are the result of rising global temperatures. On the local level in NYC, there is also the issue of glacio-isostatic adjustment. This process is not caused by current glacial melt, but rather by the modification of the Earth’s surface as it slowly responds to the removal of the massive weight of ancient glaciers. Overall, it causes some land surfaces to rise and others to sink. In NYC, the land is slowly sinking. This combination of factors is expected to intensify future storm surge events in the city. Flooding caused by high tides is often called “nuisance flooding”. As sea levels rise, however, tidal floods are expected to become a more serious problem. According to a report released this week by the Union of Concerned Scientists, coastal communities along this country’s East and Gulf coasts should expect to see a dramatic increase in tidal flooding over the next 30 years. Analyzing data from 52 tide gauges from Maine to Texas, researchers looked at how often communities flood now as compared to the past. They found that some areas have seen a fourfold increase in the annual number of flood days since 1970. Using a mid-range scenario of future sea level rise from the 2014 National Climate Assessment, the scientists forecast that, “more than half of the 52 communities can expect to average more than two dozen tidal floods per year by 2030.” Some areas, especially in the mid-Atlantic, can expect a tripling in the frequency of tidal flood events. The report also states, “This flooding will define how and where people in affected areas live, work, and otherwise go about their daily lives.” Recognizing the need to adapt, the report offers “sensible steps for building resilient coastal communities.” These include upgrading infrastructure and developing both short and long-term plans to deal with sea level rise. In advance of the U.N. Climate Summit later this month, the World Meteorological Organization (WMO) has launched a video series of hypothetical weather forecasts for different regions of the globe that are all set 36 years in the future. They are meant to show that today’s climate projections could really be tomorrow’s weather. The U.S. version of this project was released today and it focuses on sea level rise, heat waves, drought, and the warming arctic. Produced by the Weather Channel, the scenarios presented are based on projections published in the latest IPCC report and the U.S. National Climate Assessment. Watch the video below to see what an American weather forecast could look like on the not so distant date of September 23, 2050. Super-storm Sandy wreaked havoc on the greater New York City area in late October 2012. Documenting this historic and catastrophic event, the Museum of the City of New York, in collaboration with the International Center of Photography, organized the exhibition, Rising Waters: Photographs of Sandy. Presenting more than two hundred photographs in both color and black and white, subjects range from the storm itself to the physical devastation and personal loss left in its wake. Organized into six sections – Storm, Destruction, Home, Coping, Relief, and Not Over – the exhibition includes images from both professional and amateur photographers. Many of these contributors, according to the museum, were personally impacted by the storm. Opened on Sandy’s first anniversary, the exhibition runs through April 6, 2014. For more information, visit www.mcny.org. “Once Again”, an image from “Rising Waters: Photographs of Sandy” at the MCNY. Image Credit: Amy Medina/MCNY. Produced by Florida International University professors, Kate MacMillin and Dr. Juliet Pinto (a longtime friend), the half-hour production explains the science of sea level rise and explores the potential threats to the region. It also addresses the actions being taken to help keep South Florida habitable. The documentary is scheduled to air for the first time on WPBT2 – the public television station for South Florida – at 8PM on January 15th. It will be followed by a half-hour panel discussion moderated by Helen Ferré, host of WPBT2’s public affairs program Issues, and featuring: John Englander, author of “High Tide on Main Street”; Dr. Hal Wanless, chair of the University of Miami’s Dept. of Geological Sciences; Richard Grosso, Director of the Environmental & Land Use Law Clinic and professor of law at Nova Southeastern University; and Dr. Juliet Pinto, co-producer of the documentary.